I thought I’d post a few images of strength and acoustic testing conducted by Lee and Tad last weekend. Silliness abounds! Not only that, we can measure it. 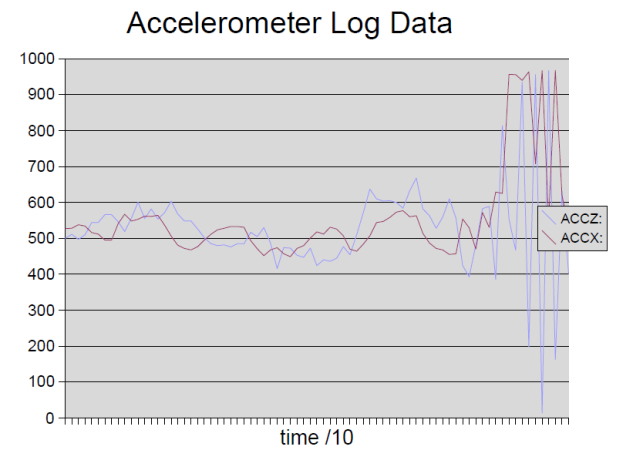 Here’s a plot of two axes of accelerometer data. This was generated by the Inertial Measurement Unit, talking to the daughterboard, passed through the SPU, then captured by the new logging feature of the mothernode dashboard application. 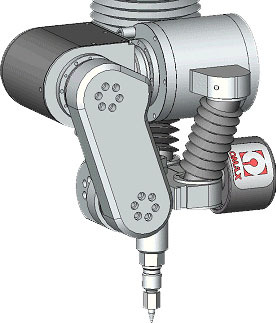 This data shows me gently turning the IMU from side to side, then waving it around. Full-court press (or should that be “roll”) this weekend for orb test in the desert next week. Come on down and help! We’ll be at the boxshop getting in the way of the Flaming Lotus Girls. 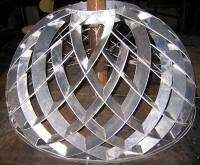 Lisa, Michael and I have been working on building more orbs. Lisa and I have been working on an aluminum orb with all the welds on the inside; we set it down next to the one with the welds on the outside and there was no question which shows off the cool lines of the orb better. Welding the inside is a tiny bit harder than the outside but totally worth it. I welded until I ran out of argon for the TIG last night so I’ll be filling that up today. On a side note, the Box Shop has been abuzz with activity. The Serpent Mother has been being polished up for her trip to the Fire Arts Festival and then Robodock. She’s got to fit in a 40′ shipping container for her trip to Amsterdam. That container is only 60% the size of the truck she took to Burning Man in 2006! 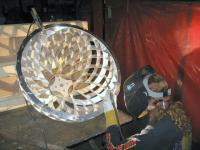 update 6-28-07: Steve Monahan gave me a hand last night welding the top and bottom of hemisphere 4. He’s got great technique. Hemisphere 3 still needs some love because of my crappy technique. We are going to try and weld just the interiors of the orbs. That does a great job of preserving the clean lines. We’ll see if that makes them strong enough. 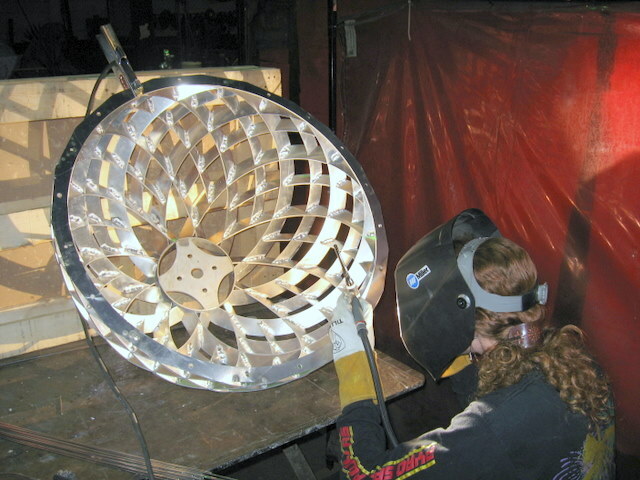 Photo: That’s Lisa doing some finish work on hemisphere #3. Well, the boards came yesterday and passed the smoke test (you plug it in and if it doesn’t smoke, it passes). Today I got everything working together: Here’s the daughterboard motor controller, sitting happily on top of mom SPU. Both are running fine and chatting happily together. That’s a warm fuzzy feeling, right? It sure is for me. 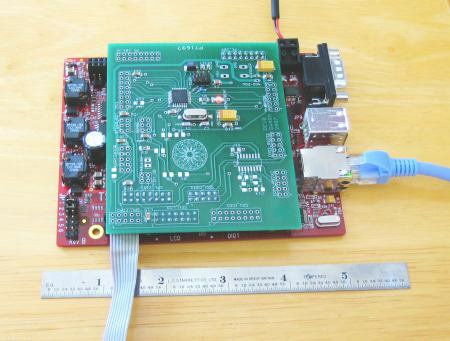 Technical details: the daughterboard contains an Atmega-8 microcontroller and mates with a TS-7260 embedded Linux board from Technologic Systems. The Linux board is the Swarm Processsing Unit, or the SPU as we like to call it. It’s the brains of the system. The daughterboard microcontroller generates motor control signals and reads analog signals from the inertial navigation unit. Petey the Programmer made the prototype version this is based on: thanks Pete! As of Saturday night, the pieces for all 6 orbs have been cut! 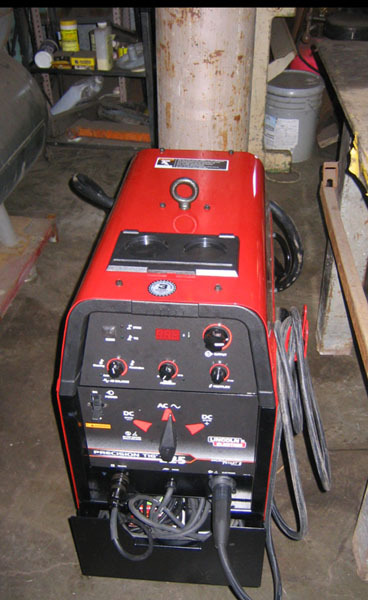 Rich Humphrey, Jon Foote, Rick Lellinger, Lisa Schile, and myself worked two marathon sessions totalling more than 20 hours to keep the Omax Model 55100 abrasive waterjet machine running. The result is more than 500 cut ribs, giving us a few to spare beyond the 480 necessary to fabricate 6 orbs. it through it’s paces. I’m pleased to report the test was a success! structurally sound and rolls acceptably smoothly. Travis, who went out of their way to help us out in our hour of need! easier to roll straight and avoid a high point at the equator. its my intention to move forward with this design feature. – The orbs look great :-)… like something made by NASA or a benevolent alien race come to destr^H^H^H^H greet us. Clear anodizing at the Tech Shop could keep them looking like that for a long time. – we didn’t try it on soft ground. Only in the shop. Here it is test-fit together, after hours of grinding by Ray, James, and Michael. Tomorrow, with luck, we weld.